Maes-y-Delyn: This little pig... and a deer? Well as our ‘freezer pig’ (bought in February to fill our freezer whilst we awaited piglets from our breeding stock) or ‘Christmas ham’, as she is known, is looking more and more likely to be carrying a litter. Matt and a friend bought a pig each from a local piggery. Now his friend is not a fan of our ‘slow growing,’ free ranging pigs (or of the quality of Berkshire meat) and swears by these commercially reared, fast growing varieties. And is a big fan of the stock raised by this local piggery. Therefore as we will not be in a position to consume our own, we joined him in purchasing (and supporting) as local businesses. They are duroc and landrace producers. And the animals are mainly raised indoors, something I do wouldn’t want for my pigs. But my Berkshires do not burn in the sun either, and at least these pigs have room and company, unlike many that reach our plates. Guess these are the compromises of commercial production. Now don’t get me wrong, I am not criticizing his methods. As he is a very experienced and his pigs are all healthy and appear content- though far less active or inquisitive than ours. And at the end of the day, we are still relatively new to this. I have to admit I did warm to him more when he was discussing our pigs with Matt. He said he loved Berkshires and that there was no comparison in the quality of meat. And that he wanted to raise Berkshires when he first started out- only there was no market for them and ended up raising ‘pink pigs’ as that was, what was wanted. Now don’t get me wrong, this guy is commercial, but by no means cruel- there are pigs reared in far worse conditions out there. His are clean, healthy and have space and company... more than many, but I’m not here to lecture on that- least not today, just can’t help but get distracted on the subject. So Friday evening the boys returned with a pig each and (unexpectedly) a deer each. The deer belong to the owner of the piggery. I wouldn’t say they are reared, or farmed, but they are there. They have had a deer from him in the past, but these were ‘freebies’ as they were providing a service. They had escaped and were causing damage (and hostility) for the neighbour. So these exceptionally well fed deer (courtesy of the neighbour paddock and house yard) made an much appreciated addition. Now Matt’s friend is not a believer in eating offal. In his opinion (which he has voiced to me numerous times) why eat it when there are perfectly good meat on a beast. I on the other hand believe if you are to take a life, then you do the animal justice and use as much as possible. 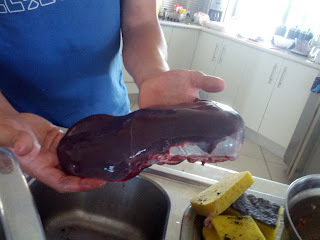 Unfortunately for me, I don’t actually like all offal, liver in particular. Now it has nothing to do with what it is, as it was always a favourite of my grandparents. And I love the smell; it smells delicious! I don’t know if it brings back fond memories, but I salivate whenever I cook it for Matt… I just wish I liked the taste! But his loss Is our gain! So Matt spent yesterday making batches of pate (something I will eat). So he used both the pigs livers and the venison livers- this will be a first for either of us. So am looking forward to reporting on the tasting. And then last night, after leaving them hang, they processed the cuts. It took about 4 hours for all 4 beasts. So tonight I go back with him to bag and tag… Then stock up the freezer.